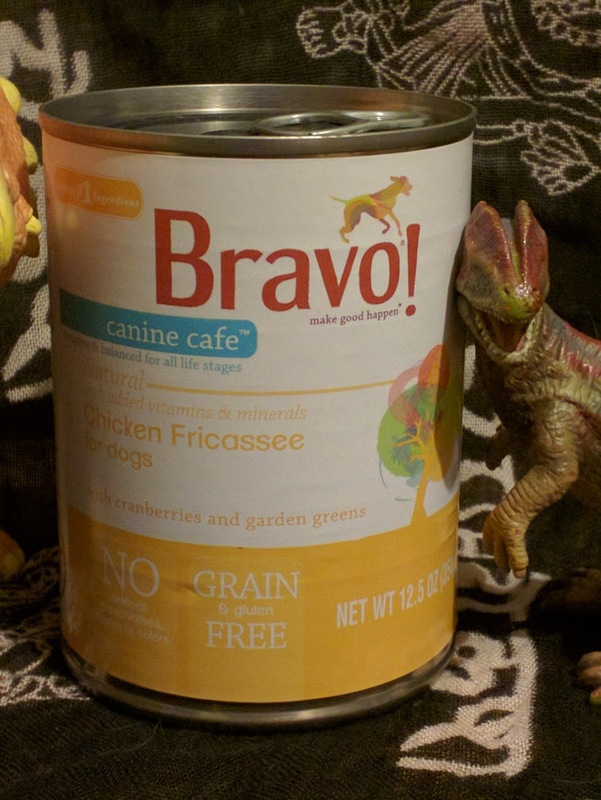 This Chicken Fricassee canned dog food is from Bravo's brand new Canine Cafe product line. These are grain-free, gluten-free, and come in three flavors each of fricassee and 95% meat. There's even one that would have been safe for Brisbane's many food allergies. * The Bravo representatives at SuperZoo were kind enough to load me up with a whole bunch of foods and treats to try, so in the interest of disclosure I wanted to mention that I didn't actually pay for this food. But I would have if I had spotted it in a store first, because Bravo totally rocks. I am a longtime Bravo customer, their limited ingredient premade frozen diets were easily the most convenient and affordable raw dog food on the market ten years ago. I used to stuff Brisbane's daily portion into Kongs and various other toys for him to unpack while I was at work. When I started identifying his many food allergies and couldn't manage portion control with a poultry-free homemade prey model raw diet, Bravo was basically the only choice. Other options were prohibitively expensive, and often included poultry. That was back in 2006, four years after Bravo began making their frozen raw food blends. They were one of the first companies to offer a premade raw diet, and they've only gotten better since then. Today their product lines include frozen, freeze-dried, and canned diets, as well as freeze-dried treats, frozen bones, and a variety of dry-roasted chews. It's worth noting that Bravo has had recalls, but has also changed their food safety procedures in response to those recalls. They are also extremely, almost overly, cautious with their voluntary recalls. One package of one food tested positive for salmonella? They recalled not only that entire batch, but also every single product made in the facility on that day. Their products undergo routine third-party testing for pathogens, and their recall history makes it extremely clear that unlike some companies, they prioritize safety over their reputation. I was surprised when I opened the can. I'm not sure what I was expecting exactly, but I was immediately impressed. I want to comment on the way this food smells, but my nose is completely stuffed up right now so I have no idea how anything smells. It could be amazing, it could be dreadful. This is a shredded-style canned food with chunks of meat and vegetables. 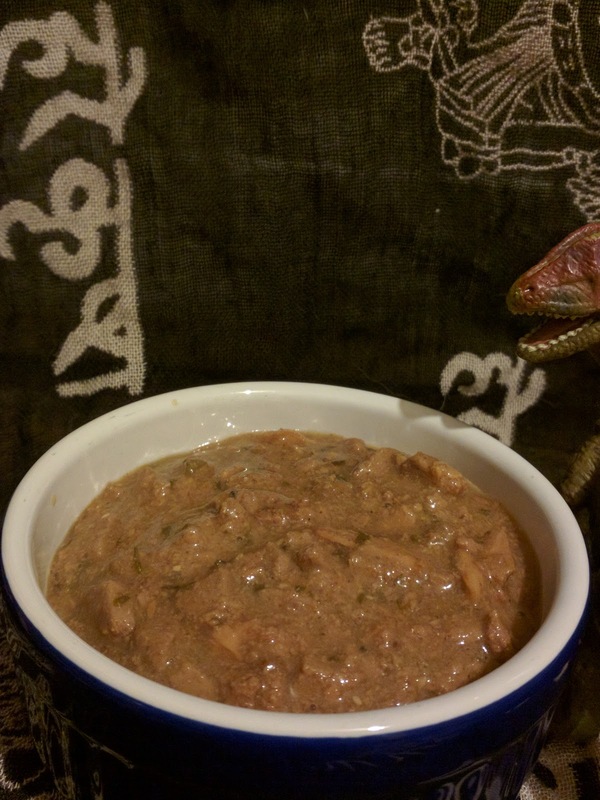 It scoops very nicely out of the can, and comes in small-breed friendly little chunks. As soon as I opened this can, I was mobbed by cats. I explained to The Hellions that this was dog food, but they ignored me as per usual. Ru really liked the Bravo canned fricassee, probably because he doesn't have to wrestle with chunks of food the size of his head. He's not always crazy about canned food, but he was immediately interested in this so I may end up feeding it on a regular basis. Sisci ate it immediately and without hesitation, but she's also significantly less discerning when it comes to food. Has the new Bravo canned food hit independent pet stores near you yet?